The Frick lab members and affiliates are contributing a lot of research talks and posters at NASBR this year. UCSC graduate student Tina Cheng talked about part of her PhD research on the environmental reservoir of Pseudogymnoascus destructans. UC Davis graduate student Jaclyn Aliperti presented on her work on frugivory behavior in pallid bats in Baja. Simon Topp presented on our project on winter ecology of bats in Sequoia National Park. 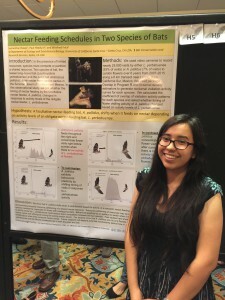 UCSC Undergraduate students Savannah Robinson and Samantha Chavez presented posters on their senior theses projects and lab volunteer Alexis Earl presented her poster on our long-term demography project of lesser-long nosed bats in Baja. I gave a talk on the work I’m doing on climate and WNS and lab collaborator Marm Kilpatrick talked about our work on invasion dynamics of WNS. 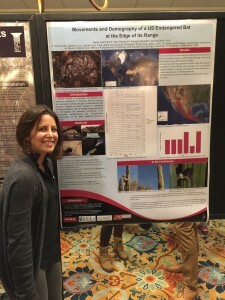 Alexis presented on long term demography of lesser long nosed bats in Baja Mexico. 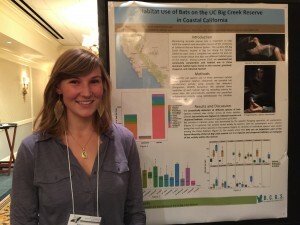 Savannah with her poster on her senior thesis project on bats of the UC Big Creek Reserve.